For my last blog post of 2013 I want to say thank you to all of you who have supported me throughout the year, I love being able to meet so many lovely people doing this. Hearing your comments and feedback is very helpful to me and it's much appreciated. To give you an insight into what's to come, there'll be some new products and themes to my work in 2014. I'm currently just starting work on a new collection, the first experiments for which I hope to share with you very soon! I don't believe that you ever stop learning in craft, as in life, and I'd like 2014 to be a year of learning, and challenge- the theme of the new collection certainly offers both, I'll keep you posted! 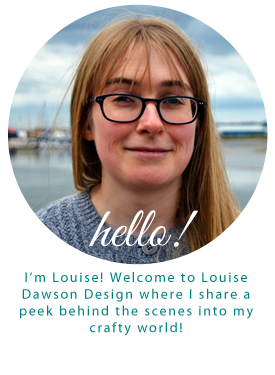 I am also aiming to develop my Etsy shop in 2014- I'd like this to be a major focus, to get Louise Dawson Design out there and introduce handmade craft into peoples lives! A big goal is to develop the Make Do and Mend/recycling themes within the work I'm making and to reflect this ethos much more strongly through my blog. Working as a Designer/Maker, by the very nature of my work I'm always creating new objects, but I don't want this to be at the expense of the planet! I'm currently sourcing more pieces to up-cycle and re-purpose into my work. 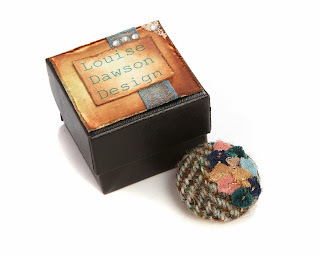 Another aim of 2014 is to get you more involved- I'm excited about the idea of developing tutorials for the blog based on the Make Do and Mend/recycled textile theme- watch this space! If there's anything you'd like to see, do let me know! So there we have it, I've put it into writing now so I had better get cracking! Wishing you all a very happy and creative 2014! I can't believe there are only two weeks left until Christmas day! I've been getting in the spirit and had a very festive weekend! On Saturday I had a thoroughly enjoyable (and unseasonably warm) day taking part in The Minories Christmas Art and Design Fair in Colchester. I enjoyed chatting to lots of new people as well as catching up with some familiar faces! There was such a lovely atmosphere and The Minories is a beautiful building for events like this- my table was in the Ballroom. On Sunday, I wrapped up warm and traveled to London to share a stand at Spitalfields with my frien Louisa Dash who makes beautiful accessories. Louisa makes these beautiful statement leather flower brooches, i-pad cases, key chains and bags. We had a lovely busy day and we did treat ourselves to some nice food from the market- it's very hard to resist! Thank you if you came to say hi over the weekend. 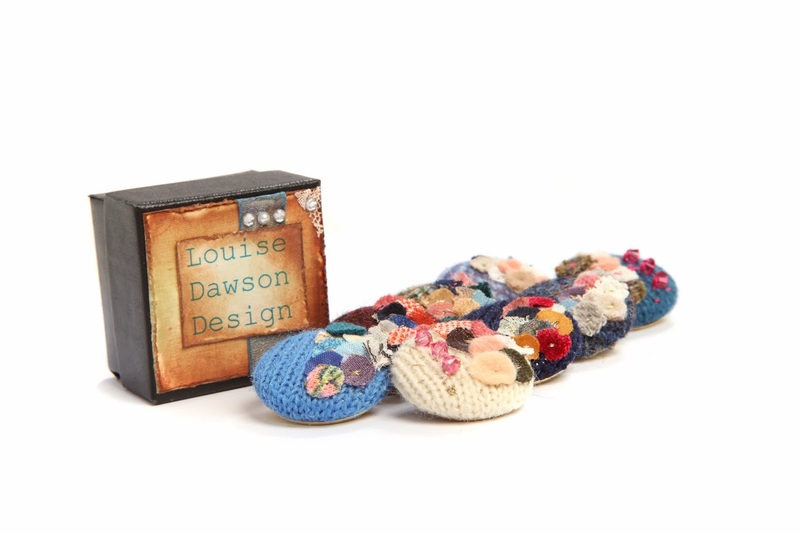 I'm happy to think that Louise Dawson Design pieces will be wrapped under some Christmas Trees :o) Merry Christmas to you all! 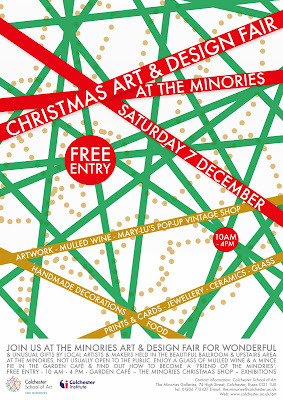 I'm looking forward to taking part in The Minories Christmas Art and Design Fair in Colchester on 7th December! 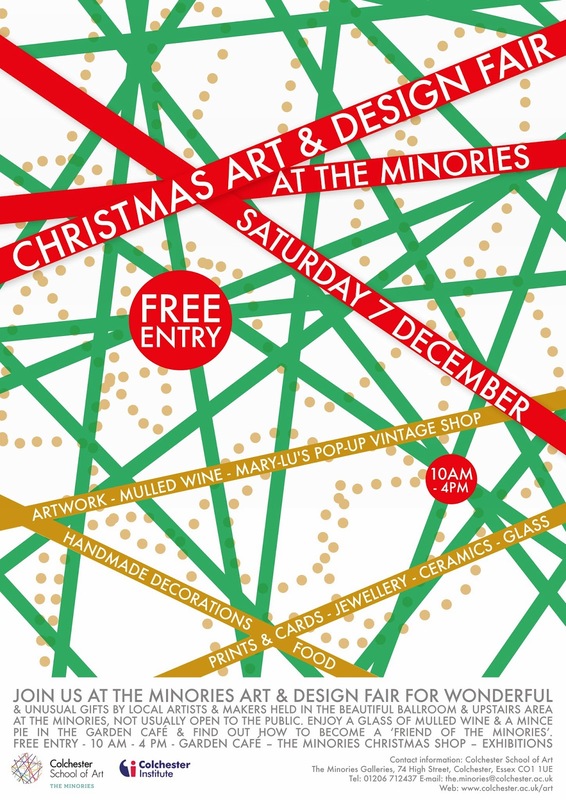 If you're in the area do pop in if you're on the lookout for unique handmade Christmas gifts- there will be beautiful Art, Jewellery, Ceramics, Cards, Prints and much more available to buy direct from the makers on the day, as well as a pop up vintage shop! It's also worth a visit to check out the exhibitions and for lunch or tea and cake in the Garden Cafe! It's on from 10-4, would be lovely to see you! In the meantime I'm wrapping up warm in the studio at Cuckoo Farm now winter is here- it's got quite cold! I'm keeping busy though and I'm currently making some hand knitted pieces (cosy!) for some events I've got coming up in early December. I'll keep you posted! 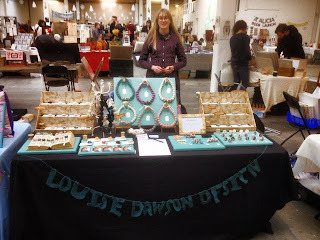 This weekend I was a vendor at The Renegade Craft Fair on London's Brick Lane and what a lovely weekend it was! I met lots of lovely people and there was such a friendly atmosphere it really was a great thing to be part of. It was also so nice to be surrounded by other like minded makers, all with a passion for the handmade. Thanks to everyone who stopped by to say hello! Renegade Craft Fair- stand sneak peak! Less than a week to go now until the Renegade Craft Fair and I'm busy working on the final finishing touches for my stand! I'm very much looking forward to next weekend! I was given two card display stands that were no longer needed and I've Decopatched them with off-cuts from dress making patterns (which I've always kept with the intention of making something with them) and black tissue paper. I had a really fun evening in with iplayer on, Decopatching away! Here are the results, two DIY Decopatch Display Stands! I'm really pleased with these! I've also been gathering a collection of old wooden thread reels that most people throw away, and with Distress Ink, letter stamps and photo clips I've made some label stands! Please come and visit me at The Renegade Craft Fair next month. I'm busy making lots of pieces that would make perfect Christmas gifts, come along and have a look and say hello! It's no secret that I love the seaside and all things sea related, so last week I was very happy to be invited on an outing to Whitstable and Margate in Kent! After lunch in the lovely Whitstable (will definitely go back there to explore the vintage shops and eat more seafood!) we headed on to Margate to visit The Shell Grotto. I hadn't heard of The Shell Grotto until very recently, but I'm so glad to have had the chance to visit, it's amazing! It's unknown how old the Grotto is or who made it- the most popular story of it's discovery comes from 1835 when the man who owned the house above the Grotto was digging a pond in his garden and he uncovered a huge hole. He lowed his young son into the hole, who reported back of tunnels completely mosaiced with shells! I can't even begin to imagine how long it must have taken, even the ceilings are covered! I would thoroughly recommend a visit here (we also visited The Turner Contemporary whilst in Margate so we made a day of it), it's an intriguing and inspiring place and a little out of the ordinary. I'm currently knitting (with help from a lovely friend) letters in beautiful Rowan Felted Tweed to make "Louise Dawson Design" bunting! I'm going to hang this on my table at Craft Fairs and events, with it's first outing being The Renegade Craft Fair in November, so I'm busily knitting away! I've used felt letter bunting in the past, but when I saw the Sirdar pattern for knitted Alphabet Bunting I knew I had to make it, it's very me! I've had a lovely day today with my friend and fellow Textile maker, checking out Spitalfields Market and the Sunday Up Market in Brick Lane, London. We've shared a stand at Spitalfields on a Friday several times and we're aiming to start selling there on a Sunday soon... Watch this space! 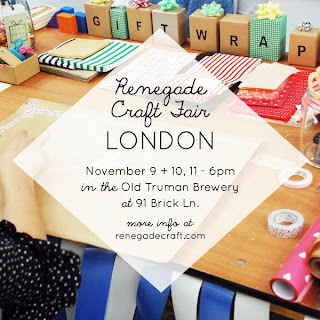 Markets are a great chance to meet Designer Makers and discover beautiful unique pieces- my idea of a great Sunday! Heaven, millions of vintage scarves! We both invested in several! Some new pieces I've made in the studio today today... Harris Tweed brooches and also knitted brooches, embellished with recycled fabric pieces. Each one is unique and perfect for accessorizing in the cold with big knits and a winter jacket! I like to wear a big cluster of them together for a hit of colour. These ones are heading to an event I've got coming up (more on this soon!) but you can check out similar ones in my Etsy shop. 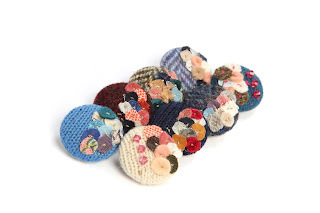 I'm currently running a competition to win one of my handmade brooches from the photo below! Head over to my Facebook page to find out more- best of luck!